There are four bajillion children’s ministry conferences out there. I checked. If you’re a children’s leader with some conference dollars, staring slack-jawed at all the options, trying to weigh one against the other, not wanting to misuse your precious and limited budget on the wrong one, here are some reasons to choose Ignite. Ignite began twelve years ago when a small group of children’s pastors decided they needed an intimate gathering of like-minded people to rest together, grow together, and share wisdom and insight with one another. Since then Ignite has grown, but its core tenets have remained the same. Sunday is right around the corner. And as soon as Sunday service is over, Sunday is right around the corner again. Pastoral life can be a grind. We’re always producing, planning, writing, adjusting, and connecting. In his book Sabbath as Resistance, Walter Brueggemann offers some interesting insight. “God is not a workaholic. God is not a pharaoh. God does not keep jacking up production schedules. To the contrary, God rests, confident, serene, at peace. God’s rest, moreover, bestows on creatureliness a restfulness that contradicts the ‘drivenness’ of the system of Pharaoh.” When’s the last time you stopped producing? Does drivenness define your life every week? Perhaps Ignite could help. We believe that children’s leaders are in great need of Sabbath! Time to rest. Time to be pampered. Time for a change of scenery. Time to clock out of the weekly ministry grind. Going to a conference can often provide this, but Ignite embraces it. The conference is held at the Intercontinental hotel. As a longtime pastor, let me tell you this is not the kind of hotel I’m used to staying in. It’s got a beautiful view of the Country Club Plaza right across the street. The Plaza offers restaurants, shopping, entertainment, and culture. There’s a beautiful river walk (or gondola ride, if you prefer) and gorgeous Spanish architecture. This conference venue is a long way from a church fellowship hall out in the suburbs. Ignite embraces the need for Sabbath in its schedule as well. We’ll spend time playing together. We offer space in the schedule for you to take in the surrounding area. We all live together in a hotel for a few days, staying up late and playing card games or going to bed early and getting that kid-free, hotel-bed sleep! 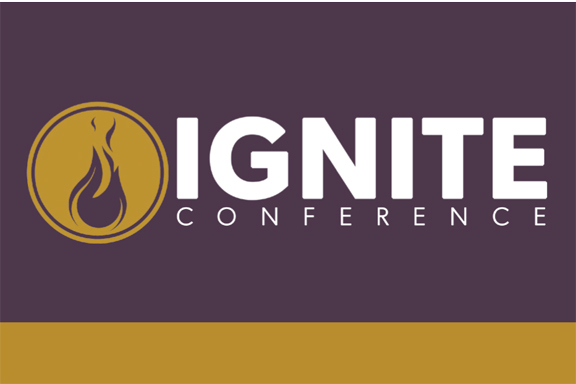 Think of Ignite not just as a conference but as a ministry retreat. Sabbath is key. Ignite has always been a small conference, but we have never let that affect the quality of our content. Our keynote speakers in the past have been many of the same voices speaking to droves of children’s ministry leaders at larger conferences, but in a more intimate setting. Our platform has held Phil Vischer, Craig Jutila, Jim Wideman, Sue Miller, Beth Guckenberger, Michelle Anthony, David Csinos, Brian Haynes, and so many others. This year, we’re thrilled with our lineup. Dr. Robbie Castleman is the author of Parenting in the Pew, a book about which Marva Dawn said, “Read it avidly and give it to everyone you know.” We are so excited to welcome Dr. Castleman’s voice to the Ignite platform. She has been influencing children’s leaders through her writing and speaking for years, and now our small group will get her full attention for a few days. Dr. Castleman told me she doesn’t like to just come and speak at a conference. She likes to come and be fully present, so expect opportunities to spend some time with her. Steven James is a master storyteller, author of tons of books, and a magnificent presenter. I’m personally geeked out because I have sat under his storytelling tutelage before, and it is brilliant. If we can all become better storytellers, we’ll become better presenters of the gospel. Jesus used stories just about every time he taught a lesson. It’s a powerful tool Steven has honed and is ready to talk about with you at Ignite. I invited Tim Suttle to Ignite after I heard him present to a room full of pastors. When he finished his first of several presentations over the course of a week, I sat in awe and had one prevailing thought: My friends in children’s ministry need to hear this stuff. Tim is an author, church planter, and a strong Wesleyan theologian with a message we all need to hear. Dr. Gustavo Crocker brings a global perspective to our conversation. His advocacy for disenfranchised children in various parts of the world led us to reach out to him. Dr. Crocker is a champion for children and children’s ministers at a global-denominational level. At Ignite we focus intentionally on theology, philosophy, and praxis through both general gatherings and more specific workshops. Whether you need 101-level guidance, like how to start a preteen ministry, or more advanced coaching, like sustainable self-care for career pastors, Ignite is the place for training! Because we keep the conference intentionally small, the training conversations are more intimate and able to go more in depth. There’s more of a chance for one-on-one interactions with presenters, more opportunities for questions, and more focus on your specific needs. You will leave Ignite feeling a network of support like you’ve never felt before. Those who have come back year after year compare it to a family reunion. The strong collegiality built at Ignite cannot be replicated at a huge conference! You’ll have an opportunity to be heard. Colleagues will hear you. Publishers will hear you. There is specific time set aside to bring the issues you are dealing with before a supportive group that can come alongside you with ideas, prayer, and even resources. You won’t get lost in the shuffle of thousands of children’s pastors. You’ll get all the personal support a huge conference can’t provide—without sacrificing the training quality. Even the training opportunities through workshops and general sessions feel more supportive because you get to know the people to your right and left. Everything you learn, you learn with your Ignite family. Come for the Sabbath. Come for the training. Come for the support. Join us at Ignite and feel like you’re coming home. Visit IgniteConferenceKC.com to learn more about Ignite! Take advantage of the early bird conference rate if you register before August 20th!